Another diverse range of grant applications was received during the last funding round and was considered at the April meeting of the Carraig Gheal Wind Farm Community Benefit Fund Steering Group. These main grants are for £250 to £7,000 and can be applied for by constituted groups. The community hall within Bridge of Orchy had fallen into a bad state of repair and by 2015 was virtually unusable. It meant that Bridge of Orchy , a remote village north east of Loch Awe in Argyll and Bute, had no public space, along with no school and very difficult to access services. Applications are now being accepted for the next round of funding for the main grant of the Carraig Gheal Wind Farm Community Benefit Fund. The joint venture partners in the Carraig Gheal Wind Farm, GreenPower and the Ampere Equity Fund, managed by DIF, are pleased to announce that a senior debt funding package has been put in place for the re-finance of the 46MW wind farm. Financial close for the transaction was achieved on 14th September 2017. The project has been operational since 2013. Works on the West Loch Awe Timber Haul Road commence this week to repair and replace a small number of the water crossings and to undertake other maintenance at the same time. The closing date for the current round of funding for the Carraig Gheal Wind Farm Community Benefit Fund - Main Grant is Monday 31st July. You still have time to get any new applications in for consideration by the local Steering Group members. The Carraig Gheal Wind Farm Community Benefit Fund Steering Group met on Monday 27th March at Dalmally Village Hall with an excellent turnout. Of the 17 main grant applications on the agenda for review and determination, the Steering Group approved 13 totalling circa £70,000. Still Time to Apply for Grant Funding! The current funding round for the Carraig Gheal Wind Farm Community Benefit Fund main grant scheme is open until 31st January 2017 so there is still time to submit an application to benefit your group. Dalmally Historical Assocation was recently successful in applying for a main grant from the Carraig Gheal Wind Farm Community Benefit Fund to help fund the publication of a local history book “it’s a far cry to Loch Awe”. Dalavich Improvement Group has secured a grant of £7,000 from the Carraig Gheal Wind Farm Community Benefit Fund to help with replacing and updating the electric wiring and distribution boards within the Dalavich Community Centre. Lorn Organic Growers received grant funding from the Carraig Gheal Wind Farm Community Fund for the replacement of the pollythene to one of their polytunnel plus timber and equipment to repair and strengthen their other three polytunnels. Applications for the next round of funding for the Carraig Gheal Community Wind Farm Benefit Fund can now be submitted for consideration. Lorn Organic Growers based at Barguillean Nursery near Taynuilt can continue to grow thanks to a grant of nearly £2,500 awarded in March 2016 from the Carraig Gheal Wind Farm Community Benefit Main Grant Fund. Applications for the Carraig Gheal Community Wind Farm Benefit Fund have now closed with a number of applications having been submitted. Applications for the Carraig Gheal Community Wind Farm Benefit Fund can now be submitted for consideration. The Selection meeting for the public member for the Carraig Gheal Wind Farm Community Benefit Fund Steering Group for the Kilmore Community Council area was held last night, 23rd February 2015. The agenda for the Selection Meeting for the Kilmore Community Council Area which is being held tonight at 7pm in Kilmore Village Hall can be viewed here. The Avich & Kilchrenan Selection Meeting has been cancelled due to the withdrawal of Isabel Grant's application due to personal reasons. The nominees for Kilmore and Avich and Kilchrenan Community Council areas have put forward their personal statements ahead of the selection meetings being held later this month. Following the invitation for nominees for the Carraig Gheal Community Benefit Fund Steering Group, GreenPower is very pleased to have received a number of nominations. Both Kilmore and Avich and Kilchrenan Community Council Areas have had two nominees come forward. GreenPower are delighted to announce that it has been selected as one of three finalists in the Best Green Business category of the Forth Valley Chamber of Commerce Business Awards 2015 which will take place at the DoubleTree by Hilton Dunblane Hydro on March 19th. GreenPower is pleased to announce that the Carraig Gheal Wind Farm Community Benefit Fund has been launched. A £1m order of 'Argyll made' components from Wind Towers (Scotland) Ltd in Machrihanish for the Carraig Gheal Wind Farm near Loch Awe has been completed, as construction enters the final phase of the 20 turbine project. GreenPower (Carraig Gheal) Ltd have today announced a community fund which will be worth about £1.6million over the 25 year life span of the Wind Farm. The first of 20 wind turbines has been constructed successfully at Carraig Gheal wind farm above Inverinan Forest, NW Loch Awe. 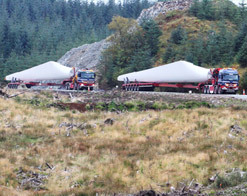 The first of 20 wind turbines were delivered successfully in the early hours of Monday morning from the Wind Towers factory at Machrihanish to the Carraig Gheal Wind Farm site NW of Loch Awe. Turbines set to roll as Muasdale road improvement opens.